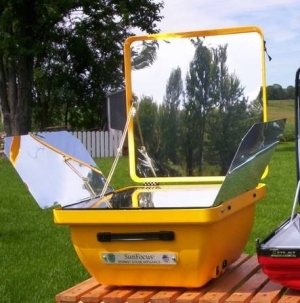 The SunFocus Solar Hybrid Oven is the latest solar cooker to come onto the market and is one of just a few that are actually manufactured here in the United States. This new, American made cooker is based heavily on the design model of the Tulsi Hybrid Solar Oven from India and has the same hybrid electrical feature that has made the Tulsi a popular solar cooker with much of the solar cooking public. The SunFocus-Hybrid Solar Cooker is manufactured by SunBD Corp., the same company who has been importing and selling the Tulsi Hybrid for many years here in the US. 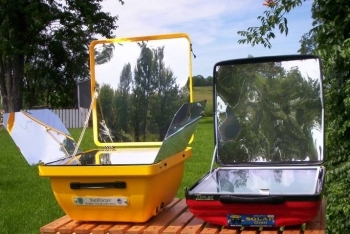 The SunFocus Solar Hybrid Oven came about due to the many requests by Tulsi customers/users that liked the Tulsi oven but who wanted a much deeper and larger capacity solar cooker. Something that could solar cook after the manner of American cooking, principally for cooking loaves of bread, whole chickens, tall cakes etc. The unique feature of the Tulsi Hybrid, or the low wattage electrical heating element built into the solar oven, is a principal selling point for that cooker because it allows for continued use of the oven even in the event the sun were to disappear due to a stormy day or night closes in before solar cooking was finished.And now, the SunFocus Hybrid Electric Oven, manufactured here in the USA is being offered with the same electrical back up feature making it truly an all purpose, all around cooker. 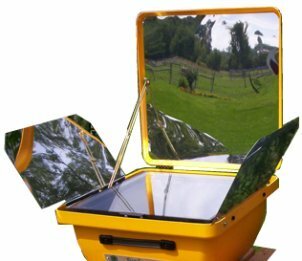 High quality materials and manufacture processes have resulted in a superior US manufactured solar oven that can cook as well as any solar cooker being offered on the market. Combination high performance solar oven and 110v. AC electric powered oven. HUGE internal cooking chamber... L13 ½ x W13 ½ x H 6 ¼ in. Temperature range up to 400 F.
Double pained oven window glass for greater heat retention. Scratch resistant anodized aluminum reflector panel for long wear. Set of side reflector booster panels. Accessories... 6ft. 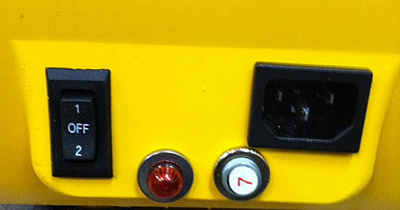 power cord, oven thermometer, set of side booster panels & set up instructions. Rugged suitcase design offers clam shell like protection to internal parts. SUNFOCUS® SOLAR ELECTRIC OVEN 3 in 1: All same features as listed above. Low heat - a slow cooking setting idea for simmering stews, soups and chilis.